Apparently Andrew Sullivan is not new to the concept of crackpot theories. Long before he went spelunking in Sarah Palin’s womb to explain the incongruous event of a woman over forty years old giving birth to a child with Down’s Syndrome (note: I am being sarcastic), he was exploring the racial differences in IQ. Groan. Well, first, actually yeah, that is kind of is racist. The only question is really whether or not it is true. And there is nothing wrong with a serious scientific inquiry into the subject. We should never shrink away from a question because we are worried what the answer might be. But The Bell Curve wasn’t that kind of serious inquiry. It was plainly an attempt to dress up regular old racism with a scientific gloss, something bigots had been doing since eugenics was fashionable. The Bell Curve of course is the book that asserted that black people, on average, had a lower intelligence than white people, or so that is what its authors claimed it proved. What it actually proved, precisely understood, is far less useful: that the people considered by a myriad of persons to be “black” tended to have lower IQ scores than people considered “white.” And when you state it like that, you start to see the hidden assumptions that completely undermine their analysis. So by using the euphemism “undocumented” they are implying that Whitman hired her without proof that she was here legally and eligible to work. That is simply not true. I am sure this implication is an oversight, but it shows you just what happens when you start using bullsh-t euphemisms, instead of just telling it like it is. She is an illegal immigrant. You might not like the laws that declare her to be one, but she broke the law by coming and working here. And it is actually dishonest to call her anything else. And at this blog I have hit that theme in the past. And mind you, I am equally opposed to using the term “illegal alien,” too. While “alien” is a technically correct term, it has carried a negative connotation since around 1979 or so. Of course the article didn’t specify what term to use. Maybe Ms. Sanchez recommends ignoring the subject entirely. (And to be fair to Ms. Sanchez she might be only reporting how others feel, without endorsing it.) But I am just astonished at our inability to even talk about this honestly. Look, we all know what is going on here. Advocates for different causes take a thing* that people dislike and rename it in the hope of escaping that opprobrium. The problem is, however, that the opprobrium is attached to the concept, not the word, so the only result over time is that the new term gets a negative connotation, too. There is no shortcut to changing how that thing is perceived, you have to work to change how the underlying concept is seen, instead of trying to slap a happier word on it. For instance, in my own life I have seen this kind of effort in relation to disabilities. When I was growing up I started to see a trend toward calling disabled persons “special” or “challenged.” And all that happened was that the same people who sneered at disabled or handicapped people started sneering at those terms too until those terms attached a negative connotation, too. These word games do not work and all they succeed in doing is annoying people. But—you might say—you yourself have just said you don’t use the term illegal alien, either. What is the difference? Well, as the link suggests, because of science fiction movies the term “alien” has become uniquely associated with inhuman life, possibly monstrous in form. * So unlike the situation with “illegal immigrant” where the opprobrium is actually attached to the concept it is describing, the term “illegal alien” carries an opprobrium unrelated to the term it is describing (although I suppose most space aliens living on earth would also be illegal immigrants as well). So, please, folks, let’s not substitute PC terms for accurate and neutral words. Let’s talk about these things like adults, and if you don’t like how a group is perceived in our society, rather than trying to change the language, why not instead change the attitudes underlying it, instead? The Most Frivolous Lawsuit Ever? He complains that he ended up getting shot by police as a result. I can only think of one lawsuit more frivolous than this in recent memory. Oh — and I plan to have a lot more to say about that one. My hint to you: at least Dimmick didn’t perjure himself. Hat tip to . . . you know who you are. Sorry for the light blogging, but in the last few days I have been dealing with a plumbing emergency. You ever hear the term “sh*t happens”? Yeah, it’s been happening. Oy vey. But in between breaks from dealing with that, I have been catching up on watching the new show Terra Nova. Probably the fact I fell behind is a bad sign for the show, because I could find myself barely caring from week-to-week what happened on it. I continue watching because frankly I could see how the show could suddenly become good, maybe even compelling, and I am hoping it does. (I remember, for instance, it took Star Trek: The Next Generation years before it got good.) But right now I am thinking that there aren’t nearly enough dinosaurs for a good “Jurassic Park: the Series” suggested by early promotions, and the human drama is just playing it a little too safe to create good human drama. If you go over to the great cutting edge dramas found on basic cable these days, you get a sense of the kinds of things that Terra Nova could be doing, but isn’t. Don’t bother with the characters and what they are doing, I want you to look at that house they are living in. This family goes 85 million years into the past to a colony that is around 8 years old, and then the moment they get through the wormhole they are given a home, completely free of charge, with the only deprivation being that two of the kids have to sleep in the same room because typically people expect families to have only two children (because of that two child law mentioned above). That’s it. 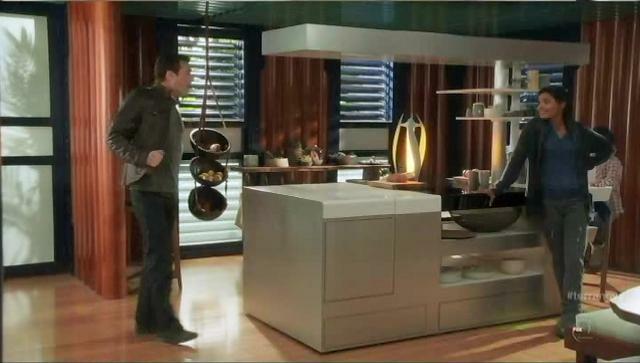 Seriously, look at that Terra Nova home again! Look at how ridiculously nice it is. It is nicer than my home. They are supposed to be living out in a new wilderness, and this place could be literally anywhere in suburbia (indeed, probably is on a sound stage in some Hollywood studio lot). When you watch people talking in a place like that you get absolutely no sense that nature is outside ready to crash in and kill them all. Everything feels a little too safe, even outside this home. In this sense it all reminds me of another Spielberg-produced TV show “Sea Quest” which had all the ingredients that should have made a great show, beautiful sets and excellent special effects and bored its audience to death in part because you never felt like anyone was in danger. But the title of the post tells you that I don’t want to review the show generally as I just have, but instead I want to talk about a specific issue: whether Terra Nova is eco-fascist. It was watching last week’s episode “Vs” that really drove home this issue to me, so there will be a lot of spoilers concerning episodes over a week old. So we’ll continue below the break. Just so y’all know “reassessing” is code for “packing office boxes with stolen laptops” and calling friend[s] in other campaigns. The latest allegation swirling around businessman Herman Cain — that he conducted a 13-year long extramarital affair with a woman named Ginger White — could well amount to a political death blow for his already-reeling presidential campaign. And that’s bad news for former Massachusetts governor Mitt Romney. The latest allegations regarding Cain, when coupled with the dead-in-the-water candidacies (at least for the moment) of one-time conservative alternatives Perry and Bachmann, make it increasingly likely that Republicans looking for a Romney alternative will view Gingrich as the only viable option. One problem with that analysis: a recent poll — by the WaPo, no less — showed that if Cain dropped out, Romney was likely to benefit as much as or more than Newt Gingrich. That poll was taken when Cain’s standing was just starting to erode and Gingrich was just starting to rise. Thus, it’s possible Newt has already reaped most of the benefit of Cain’s decline and that a Cain dropout would now benefit… Mitt Romney. Update: PPP pegs Newt as the likely beneficiary of a Cain pullout. Many may find the results of the CBO study surprising. It turns out, Ryan reports, that federal income taxes (including the refundable Earned Income Tax Credit) actually decreased income inequality slightly between 1979 and 2007, while the federal payroll taxes that supposedly fund Social Security and Medicare slightly increased income inequality. That’s despite the fact that income tax rates are lower than in 1979 and payroll taxes higher. The income tax side is probably more surprising; conservatives have noted that “the rich” paid more under the Reagan-Bush tax cuts, but few have connected to the point that the tax cuts decreased income inequality. We probably did not need a CBO study to remind us — or maybe we did — that the entitlement state is largely in the business of transferring wealth from unwealthy youngsters to seniors comprising the most wealthy generation in the nation’s history. The left has tended to rationalize their own engine of income inequality based on the continuing nature of programs like Social Security and Medicare; today’s youngsters supposedly benefit when they become tomorrow’s seniors. However, the days of seniors reaping a windfall is likely drawing to a close as the unsustainability of the national debt becomes ever clearer. Future generations will suffer over the course of a lifetime without that pot of gold at the end of the rainbow. But don’t expect the unwashed hipsters of the Occupy movement to stake out their local nursing homes or direct their venom at the 13 Percenters, because their protests really are not about income inequality. The Occupiers really just want their bailout (without the expectation of repayment, unlike the Big Banks) from the higher education bubble and their Blue Model jobs. Obama to abandon white working class? Not quite. Slate’s resident JournoLister, Dave Weigel, apparently thinks it’s raaaacist of FoxNation to highlight the most provocative part of an NYT post by Thomas Edsall making the claim. Weigel is particularly taken by a photo of “Obama gritting his teeth and waving ‘see ya,’ while flanked by his wife and an unidentified black guy. Others might figure the photo was selected for the first part, not the second, but others don’t have a history of secretly trying to shape media coverage of Obamacare while pretending to be covering the right from the inside. At least Weigel is imputing bad motive openly now. The blogosphere is mostly focused on the second sentence. Before casually flinging the race card, Weigel correctly emphasizes the first: “The funny thing here is that ‘abandoning’ the white working class means ‘continuing to lose voters who have been voting Republican since 1966.’ ” It’s not clear whether Weigel is implicitly flinging the race card again by selecting 1966 as his benchmark, but between 1960 and 2004, Democrats lost 12 percent of the non-Southern white men and 17 percent of white men in the South. Nevertheless, it is fair to note the drop was particularly acute (.pdf) among the white working class during the period colloquially known as the Sixties — 55% of whites without a four year college degree voted for Dems in 1960-64, dropping to 35% in 1968-72. Some of this was racial, but arguably had more to do with the ascendancy of the New Left within the party, at the expense of organized labor. The hippie/Yippie-ization of the Democrats, which allowed the GOP to characterize the 1972 platform as “amnesty, abortion and acid” had as much to do with the migration of whites to the GOP as Selma or Watts. a center-left coalition made up, on the one hand, of voters who have gotten ahead on the basis of educational attainment — professors, artists, designers, editors, human resources managers, lawyers, librarians, social workers, teachers and therapists — and a second, substantial constituency of lower-income voters who are disproportionately African-American and Hispanic. Edsall just cannot bring himself to explain why, beyond a vague reference to GOP efforts to fracture the Democrat coalition. The reason is the slow death of the progressive blue model under the weight of our expanding national debt. That’s why the first part of the coalition Edsall describes identifies with the Occupy mob. Tax reform that will likely be adopted to stave off the debt bomb will also hit the upper-middle class in Blue states harder than most. The collapse of big government (and public sector pensions) will hit middle-class minorities hard as well. In short, the white working class has been abandoning the Democrats long before Obama came on the scene. They are just among the first off the sinking ship of progressivism. Obama could end up above water in 2012, but the longer-term trend remains bleak, as progressivism ends up with less and less to offer the remains of its coalition. Page loaded in: 0.2048 secs.